Grow your own eggplant from seed and create delicious culinary favorites such as Eggplant Parmigiana. The mention of the word, eggplant, often brings to mind another word: parmesan. While eggplant parmesan is a world famously delicious dish, some people may not appreciate how eggplant makes a savoury addition to a plethora of other culinary delights. Eggplant can be sauteed, simmered, fried, and baked along with any number of other ingredients to make a nutritious, hearty vegetarian meal that may satisfy even the most committed carnivores. Eggplant or Aubergine—Solanum melongena—is a member of the huge Solanaceae family, containing more than 2000 species of plants. Some plants in this family—belladonna, for example—are quite poisonous! 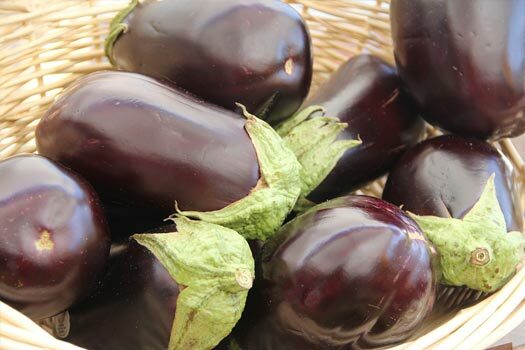 Similar to a plant like tomatoes, eggplants aren’t technically vegetables—they’re fruits. They are also known as a member of the nightshade family, which also includes peppers, potatoes, and tomatoes. Nightshade vegetables seem to be generating controversy in health and nutrition circles these days: while it’s acknowledged that they are relatively low in calories, high in fiber, and contain a number of important nutrients, they also contain a substance called sonanine which is thought to cause inflammation in the body. A quick bit of research suggests the jury is still out on this issue. Anyone with questions or concerns should consult a medical professional. Eggplant is native to India and environs, where it is considered the ‘King of Vegetables’, but is now found throughout the world. English colonists in India named it eggplant due to varieties’ egg-like appearance. These days, you can find all different types of eggplant at farmers markets, etc., though we remain partial to our tender, prolific class Black Beauty variety. Eggplant are heavy drinkers and feeders. Regular gentle watering is key but be careful not to wash seedlings away. Deep, well-drained sandy soil with a pH of 6.5-6.8. The soil temperature must be at least 70° F; ideal germination temperature is 85° F.
Outdoor temperatures must be at least 65° F.
Start eggplant seeds indoors 8-12 weeks before your last anticipated spring frost; transplant seedlings outdoors once it’s consistently warm outside. Sow seeds 1/4 inch deep. Space according to seed packet instructions. When transplanting outdoors in spring, raised beds, with their warmer soil, are preferable. Soak seeds overnight to encourage germination which takes 7-14 days. 70-90 days from time of transplant. Apply organic fertilizer to the seedlings after their true leaves appear. Add rich compost or additional organic fertilizer every six weeks thereafter. Add mulch as the seedlings develop to retain moisture and warmth and discourage weeds. Eggplant plants are susceptible to a variety of insect pests and diseases, unfortunately. You can mitigate the threat of insect pests by using row covers. Rotate crops regularly and make sure plants have plenty of air circulation to avoid disease. Good companion plants are legumes such as peas and beans which leach nitrogen into the soil which is needed by the eggplant plants. Bush beans and herbs repel common insect pests. Other members of the nightshade family such as tomatoes and peppers work well too. Yes, if you have a pot with at least a 5-gallon capacity. You can harvest eggplant when it’s a bit bigger than your (adult-size) hand) and when its skin has a nice reflective shine. Be careful when pulling off the fruit as there may be some sharp thorns on the stem or on the top of the plant. Distinctive-looking eggplant is a great complement to your other garden vegetables. Our popular, heirloom seed variety—Black Beauty—yields a high volume of large, tender, tasty fruit. Densely-textured and filling, eggplant is a satisfying meat substitute. Heat loving and slow growing; eggplant needs a long, hot growing season. Eggplant is nutritious and is a good source of vitamin C, vitamin K, vitamin B6, and various important minerals such as magnesium, potassium, and folic acid. It’s also a great source of dietary fiber.